Friday Quiz: turning or parking? The correct answer is: it makes no difference. Oncoming traffic has to assume they are are turning vehicle, so slow down for a junction in a way that the painted give-way signs would never achieve. This shows how Bristol's drivers do think of the safety of others, not just when driving, but when parking. 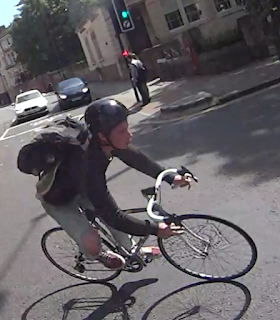 This is filmed from St Pauls Road, leading from the dull part of town, Clifton, to the more interesting bits, albeit after a final bit of climbing and a university area inevitably full of texting students. Approaching the lights, they're red, time to hang around for a while waiting for green. And then slowly off, in case the BMW driver is in an hurry. No problems there, except carving out from the left is someone on a road bike, looking like they are near that 20 mph limit, blowing straight through the red light to make a high speed turn into St Pauls Road. What were the risks this fuckwit exposed themselves to? If a vehicle coming out of St Pauls road had been in a hurry, he'd have cycled into it. And of course, if our tax-dodging reporter hadn't been so slow setting off: they'd have been in the crash too. Which is why we think this fuckwit deserves coverage.